Download "Present Perfect x Past Simple Předpřítomný čas x Minulý čas Pracovní list"
1 VY_32_INOVACE_AJ_133 Present Perfect x Past Simple Předpřítomný čas x Minulý čas Pracovní list PhDr. Zuzana Žantovská Období vytvoření: květen 2013 Ročník: ročník SŠ Tematická oblast: Gramatika slovesa Předmět: Anglický jazyk Výstižný popis způsobu použití výukového materiálu ve výuce: Praktické procvičení (případně opakování) tvarů a použití předpřítomného a minulého času v anglickém jazyce. 2 1/ Make these sentences negative 1. We were shopping at 2 o clock yesterday. 2. She s seen this film twice. 3. I had to go to the dentist. 4. They have been waiting here for two hours. 5. There were a lot of people at the meeting. 6. He s already done it. 7. She fell off the chair. 8. This time yesterday I was playing tennis. 9. Lucy is tired. She has been running. 10. Their house was destroyed by the fire. 2/ Use since or for 1. ages 6. 2 o clock 2. I was a child 7. last winter 3. Christmas 8. 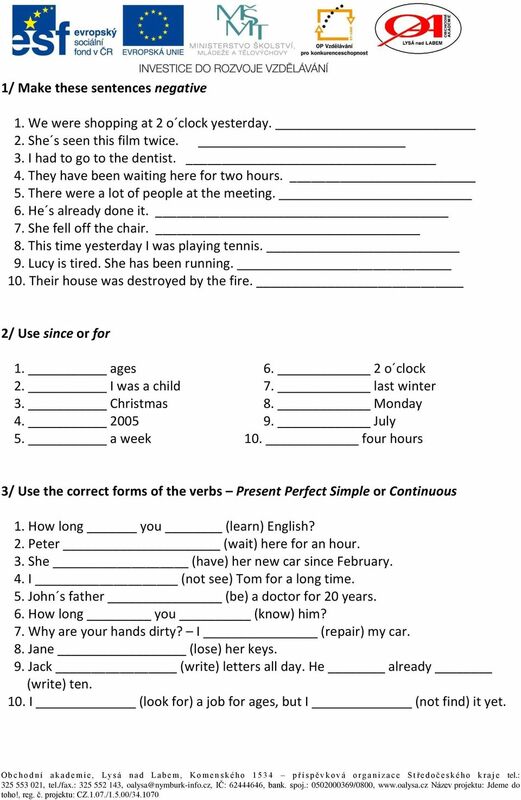 Monday July 5. a week 10. four hours 3/ Use the correct forms of the verbs Present Perfect Simple or Continuous 1. How long you (learn) English? 2. Peter (wait) here for an hour. 3. She (have) her new car since February. 4. I (not see) Tom for a long time. 5. John s father (be) a doctor for 20 years. 6. How long you (know) him? 7. Why are your hands dirty? I (repair) my car. 8. Jane (lose) her keys. 9. Jack (write) letters all day. He already (write) ten. 10. I (look for) a job for ages, but I (not find) it yet. 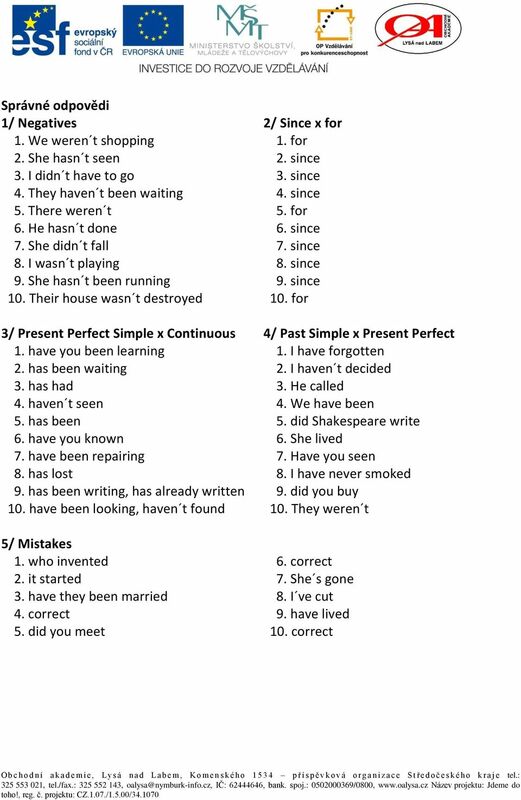 3 4/ Put the verbs in brackets into the Past Simple or Present Perfect Simple 1. Oh dear, I (forget) her name. 2. Where are you going on holiday? I (not decide) yet. 3. He (call) me last week. 4. We (be) to France twice. 5. How many books Shakespeare (write)? 6. She (live) in Prague for 5 years. Then she moved. 7. you (see) that film before? 8. I never (smoke). 9. When you (buy) your new car? 10. They (not be) at work yesterday. 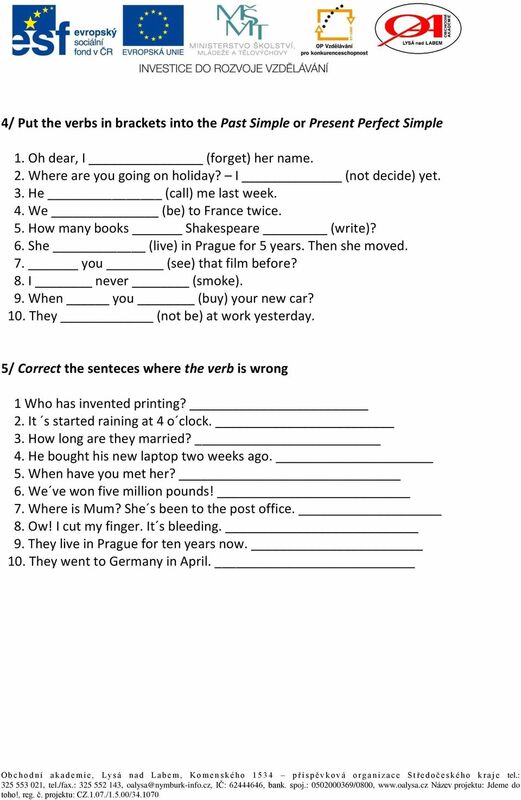 5/ Correct the senteces where the verb is wrong 1 Who has invented printing? 2. It s started raining at 4 o clock. 3. How long are they married? 4. He bought his new laptop two weeks ago. 5. When have you met her? 6. We ve won five million pounds! 7. Where is Mum? She s been to the post office. 8. Ow! I cut my finger. It s bleeding. 9. They live in Prague for ten years now. 10. They went to Germany in April. The form of the verb in past simple is the same for all persons. In questions and negatives we use did/didn t auxiliary verb and the base form. VY_22_INOVACE_17_AJ_3.02_Jazykový test. V hodině žáci vypracují test, naleznou správná řešení a doporučení.